Give your kitchen that custom feel with this contemporary style bar stool. The bar stool is finished with a warm cherry finish and a black vinyl seat for added comfort. The seat back consists of a double cross-bar pattern that gives it a nice visual focal point. Whether placed at a counter bar or a counter height table, this bar stool is sure to provide comfort and class. 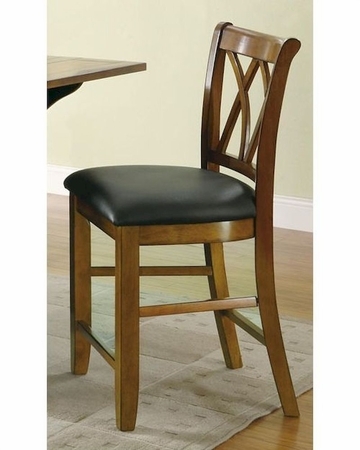 Counter Height Chair - 25.5"L x 20"W x 42"H, Seat Height - 24"